While growth is a top priority for companies of all sizes, it can be extremely difficult to create and maintain—especially in today’s competitive business environment. 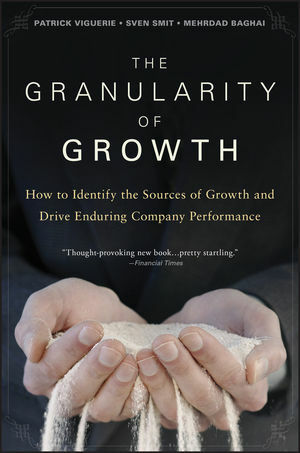 The Granularity of Growth will put you in a better position to succeed as it reveals why growth is so important, what enables certain companies to grow so spectacularly, and how to ensure that growth comes from multiple sources as you take both a broad and a granular view of your markets. PATRICK VIGUERIE is a Director at McKinsey & Company and leads the firm's strategy practice in the Americas. His work focuses on helping companies develop and implement strategies for renewal and growth. Viguerie has served companies in a wide range of industries and has published a number of articles on corporate strategy issues. He holds a BA from Dartmouth College and an MBA from Harvard Business School. SVEN SMIT is a Director at McKinsey???&?? ?Company, coleading McKinsey???&?? ?Company's strategy practice's initiatives on growth. He has served companies in a range of industries including telecommunications, high-tech, and media and has published a number of articles on growth. Smit holds a degree in mechanical engineering from Delft University of Technology and an MBA from INSEAD. MEHRDAD BAGHAI is Managing Director of Alchemy Growth Partners, a boutique advisory and venture firm in Sydney. He is coauthor of the international bestseller The Alchemy of Growth and has published a number of articles on growth. He was the coleader of the global growth practice at McKinsey???&?? ?Company in the late 1990s. Baghai received a BSE from Princeton University, an MPP from the Kennedy School of Government, and a JD from Harvard Law School. Part I. Your Growth Ambition. 2. Understanding Your Company's Performance. 3. Firing On Multiple Cylinders. Part II. Your Growth Direction. 7. Firing On Share Gain. 8. Mapping Your Growth Direction. 9. To Move Or Not To Move? Part III. Your Growth Architecture. 10. The Architecture Of Growth. 11. Looking In The Mirror. 12. A Blueprint For Granularity. Conclusion. Choosing To Lead Growth. Appendix 1. Growth And Value. Appendix 2. Two Ways To Grow, Two Ways To Go.